Along Building Tomorrow's journey, you have put us on your shoulders and carried us to places I never dreamt of on that first trip. Never is my sense of pride and gratefulness for what you have done as powerful as on the tail end of a visit with our staff and in our communities. I hope you'll allow me to start a new tradition with you-sharing my reflections after this and subsequent visits-giving you a glimpse into Building Tomorrow's work on-the-ground. Each trip, I eagerly look forward to dropping in on our communities. On a visit to the Building Tomorrow Academy of Kyeitabya last week, we met with the headmaster, Emmanuel and his team of two other teachers. Just opened, the school has 76 students through P3, though Willy Kajubi, our Education Support Officer will tell you there could easily be 500 students one day. Emmanuel, a fiery twenty-something spoke confidently about the first month of class. Though the challenges are many, he spoke at length about an engaged community and the ‘beautiful classrooms' that greet students each day. 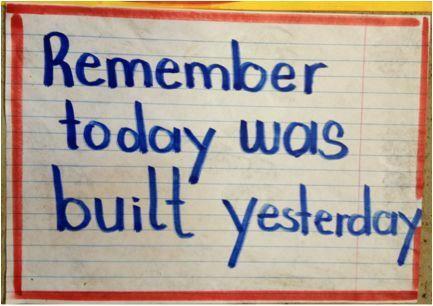 "Remember, today was built yesterday." I thought to myself, that's why we're Building Tomorrow. With 15 Building Tomorrow Academies built or underway and a desire to scale in the years ahead, much of our week was spent documenting the Building Tomorrow model and walking through how our work can be improved. Guiding us through this highly-technical exercise was our masterful Jack of All Trades, Maggie Kirkpatrick and Country Director Joseph Kaliisa. In total, we spent in upwards of 40 hours debating, writing and offering ideas for conversation. It was meaty, but timely, too. As we prepare to welcome a Program Manager to our team to oversee our construction-related activities and ramp up our investment in ensuring the delivery of quality education, the conversation was rich and the final product now much anticipated. In the coming weeks, we look forward to sharing this comprehensive document detailing our model with staff and supporters. The picture in the background is showing you a well-constructed and finished school. 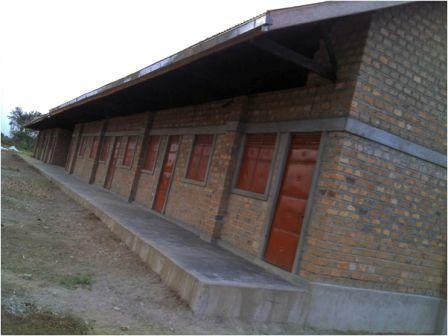 Am happy to send you that picture and I think I've moved a step ahead as community development (officer). Burungu, arriving a bit late from Kidula on Saturday morning brought a pineapple from the site, which we collectively devoured in celebration. His colleagues offered him a round of applause and Burungu went on to speak of how the community expected great things now from their children, far more than they had before Building Tomorrow's work commenced. These are exciting times at Building Tomorrow. With commitments taking us up to 20 Building Tomorrow academies and a dedication to improving quality inside each classroom, we have a long road ahead-one made all the easier to travel with the support and friendship of all those who believe in our mission. George Srour is the Founder of Building Tomorrow and Chief Dreamer.